Boho, bohemian, boho chic…however you want to say it, bohemian weddings are becoming the next big thing. To keep the bohemian theme consistent, it is also important to focus on the style of your little flower girl. Boho style flower girl dress will have your little one strutting down the aisle looking like a miniature version of the super chic bride! Buying dresses for your flower girl can be tricky enough, so you may not know what to look for especially when shopping for boho flower girl dresses. Here are a few tips and tricks to make this process easy and help you to pick the perfect style that will have all eyes on your bohemian flower girl. Although the bride has the ultimate decision in what wedding dress she wants her flower girl in, communicate with your little one. Of course, if she is at an appropriate age, ask her simple yes or no questions. For example, do you want to have a lot of lace? Do you want a dress with any sequins? Do you want a white dress? While trying to determine the style for your boho flower girl, browse different websites and blogs online to get visual examples of other bohemian girl dresses. Papilio Kids Ceremony collection has some great flower girl dresses suitable for any style. If you want a lace boho flower girl dress, the lace bodice gown with a handmade flower décor is both unique and adorable (K6006 style). For a vintage flower girl dress, the ivory knee length dress with lace peplum detail has a more rustic and old school charm to it (K5024 style). As long as you tie in the style of her dress into the style of the wedding, there is not need to worry about choosing the “right” style. Second, match the dress to the season. When choosing the perfect boho flower girl dress, keep in mind the time of year the wedding is taking place. As most bohemian weddings tend to be in an outdoor garden/backyard setting, a bohemian flower dress with or without sleeves makes all of the difference. 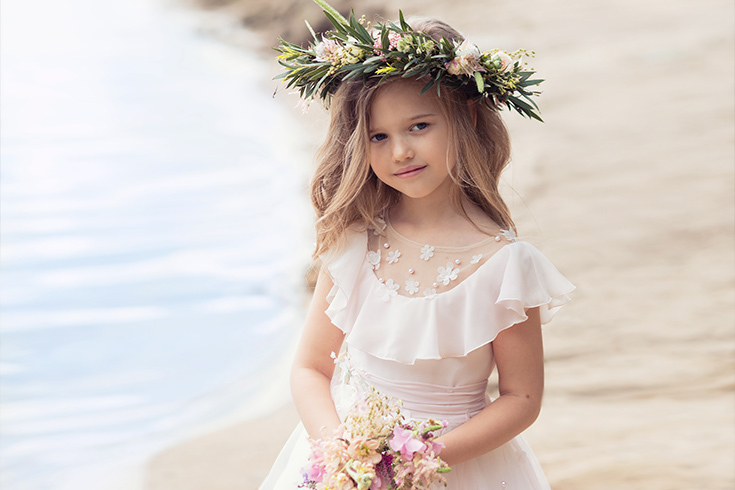 Papilio Kids Ceremony collection has rustic flower girl dresses with illusion sleeves if you decide to opt for a long sleeved dress. The beautiful knee length lace gown with a ¾ length illusion sleeves (K449 style) or the long sleeved lace bodice gown (K4084 style) will provide both comfort and vintage flair to your boho chic flower girls. Third, white isn’t always the right choice. When it comes to the color of your boho flower girls dresses, why not go for a light pink, royal blue or even red? As long as the dress style matches the bride’s gown, then the colors do not necessarily have to be the same. Royal blue is a sensational color that makes almost any eye color pop! The long sleeved bodice lace boho flower girl dress (K7010 style) is available in a dark blue, which will give your bohemian flower girl a completely different stylish look. Not feeling blue? The A-line tulle dress with a ¾ length illusion sleeve (K6004 style) is available in an ivory – pink combination and is great to compliment lighter skin or hair color. Remember to make your little girl feel just as important as the bride-to-be when shopping for her boho flower girl dress. Encourage your flower girl to try on different colors, styles and lengths of dresses to get an idea of what looks best on her. Stay calm and shop on!